Oberdan Bezzi is quite popular name in the motorcycle designing world. His sketches gave the futuristic presence of the bike. He has designed several sketches and many of them are also considered by Bike Builders and Firms. 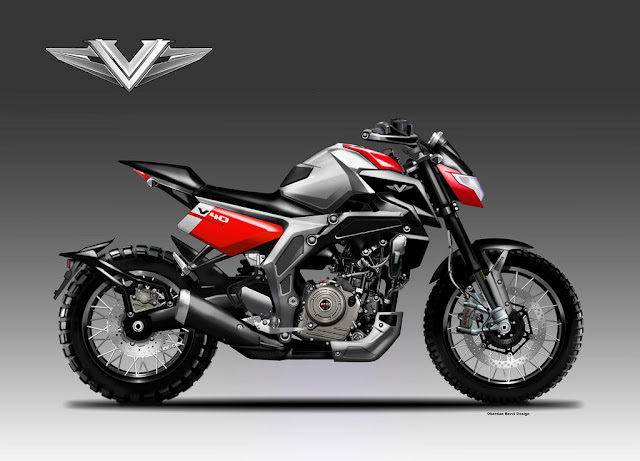 Today he has came up with the new Bajaj V40 Naked Street Design called Bajaj V40 Stalwart. The bike got the completely new body design but the engine might be the same of of Bajaj V40. Now Edges can be seen on the bike giving it a muscular look. Tyres are also new which could be used for dual purpose. Rear tyre got Hugger and the number plate. Rear light is under the tail. Side Panels got V40 Stalwart marked on it. Front fender is also short. Both the tyres got disc brakes. This is quite well designed naked street version of a bike you will see.